About 2,000 people have signed a petition about changes to a Swansea school's uniform policy after pupils were made to sit in a hall and miss lessons for wearing the wrong trousers. 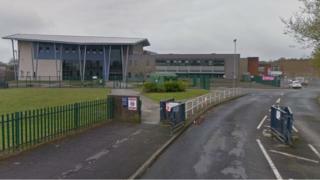 Penyrheol Comprehensive pupils must wear clothing with its "trademark", including trousers and skirts. Some parents have said they were unable to buy uniform in the right size. Swansea council say they are "concerned about children's access to a good education" rather than wearing a logo. "It is a matter we will be discussing with the school as soon as possible," added a council spokesman. School uniforms: How can I afford this? Advice was given to parents about the new policy which said trademarked clothing ensured "standards of smartness". About 70 children were pulled aside on Tuesday, the first day of term, over the issue. An audio recording of a man has appeared on social media warning the children that they "won't be going into lessons without our school uniform". Melanie Jones, who started the petition, said: "Plain black trousers or plain black skirts should be sufficient." Her petition has attracted lots of reaction and signatures although not all are necessarily parents from the school as anyone can sign it. A school spokesman said: "Following Tuesday's meeting just a handful of pupils are not wearing the correct uniform and don't yet have them on order. We are continuing to talk with their parents."